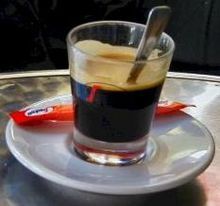 Espresso is a type of Italian coffee that is concentrated. In order to make espresso, coffee beans are powdered and hot water is added under high pressure. This is done using an espresso machine or a macchinetta. Usually, espresso is made using 7 grams of coffee beans. This gives espresso a very strong flavor. Because espresso is so strong, it is usually mixed with other coffee drinks in small amounts. There are many drinks that use espresso, such as latte, cappuccino, caffe mocha and caffe macchiato. It is sometimes spelled expresso, with an X. There is some debate as to whether this is an acceptable spelling. This page was last changed on 1 September 2018, at 18:39.